One of the classic colletions of contemporary comics is now back in print in this softcover edition. This edition appears to be identical in size and contents and reproductive quality with the original out of print hardcover edition. The 350 pages of wordless comics, both in startling black and white and luscious cartoon color, will transport readers into a vivid realm that is part waking dream part parallel universe in which natural laws are clearly in effect but off kilter. Woodring has continued to visit this realm in a series of works, including this year's Congress of the Animals and last year's Weathercraft. 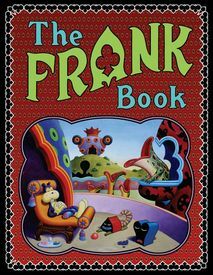 The Frank Book is where it all begins – representing the initial voyage of discovery to this previously uncharted region – and remains the essential volume that belongs in every self-respecting comics reader's library. Dan Clowes states, "Frank, and I say this without a shred of hyperbole, is a work of true genius by one of the all-time greats."